Joyce H. Opdyke, 72 of Salisbury Township, died Friday, July 23, 2010 in St. Luke’s Hospital. 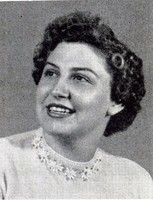 Born: July 8, 1938 in Stockton, NJ, she was a daughter of Margaret Conklin Fisher and the late Jasper Fisher. Personal: A graduate of Easton High School, she had been employed by Boscov’s in Palmer Township for more than ten years. Survivors: Her mother. four children, Edward of Salisbury Township, Peggy McBride and husband Darren of Wind Gap, Penny Jennings and husband James, Jr. of Nazareth, and Jamie, with whomshe resided, and Jamie’s signifiant other Harry Brotzman; siblings, Leon Fisher, Roben Fetherman, Lloyd, Ronald and Jeanette; six grandchildren and four great-grandchildren. Services: will be held 10:30 a.m. Wednesday, July 28 in the Ashton Funeral Home 1337 Northampton Street, Easton, with calling period from 6 to 7:30 p.m. Tuesday in the funeral home.